Springtime at Ambrosia apple orchard. There’s a reason that people say springtime is magical. Just visit an Ambrosia apple orchard when the bees are buzzing around the pink and white blossoms that have just burst open to see for yourself. Stunning as it is to wander through this pastoral beauty; the real magic is what you don’t see. Those bees are doing a lot more than collecting nectar. Bees play a critical role in ensuring that those pretty blossoms eventually turn into apples. This process is called pollination. Bees visit a blossom to collect nectar but they don’t just visit one blossom and return to the hive. They buzz from blossom to blossom gathering as much nectar as they can. Along the way, their tiny hairs gather pollen from each flower. When they visit the next flower, they drop a little bit of this pollen. This simple, unintentional act is what fertilizes the flower and allows it to become an apple. Without bees, the processes of collecting pollen and depositing it on each blossom would be incredibly labour intensive. Luckily, farmers have bees to do the work. Many orchardists keep bees while others will rent bees from a bee wrangler. Rented bees arrive at night (after all of the bees have returned to the hive) and are released to a fresh orchard in the morning. 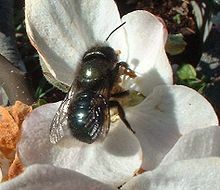 Bees will cover several kilometers in search of food and return to the hive. For each acre to be pollinated, a farmer will likely need one hive of bees for 7 – 10 days. Once the blossoms have all been pollinated, they bee wrangler will put the bee hives back on the truck and move the bees to the next orchard. So, the next time you crunch into a delicious Ambrosia, thank the bees. And, if you have the opportunity to visit an Ambrosia orchard this month, pay very close attention to the magic happening all around you.